Drinking too much milk leads to many wet diapers, so what better way to change your baby than on the Milk Dresser and Changing Table which combines a changing table and dresser where diapers and changes of clothes are easily stored and accessible? The modern and versatile cabinet has three roomy drawers that are opened with special cutouts on the drawer fronts, just like the other Milk Collection pieces. As your baby grows and wet diapers become less frequent, the changing table can be removed to leave you with a chic and convenient dresser for your toddler. 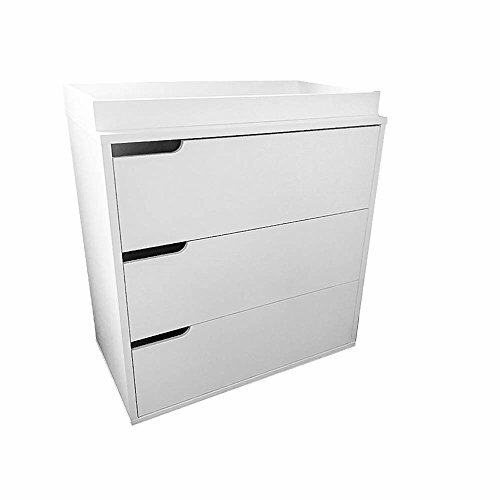 The dresser and changing table complements the rest of the Milk Collection for a complete and modernly sleek look! Meets all ASTM and CPSC USA safety standards. Non-toxic finish meets all children's safety requirements. Safe laminated rails make cleaning easier and resist moisture and moisture related molds and bacteria. If you have any questions about this product by Little Guy Comfort, contact us by completing and submitting the form below. If you are looking for a specif part number, please include it with your message.